The Office of Outreach and Engagement can help connect your community to University of Iowa resources. Whether you're looking to host an event in your community, collaborate with faculty and students on a community project, or find a faculty partner for community-based research, our staff can help find the best on-campus matches to address your community's needs and priorities. Look over the list below for ways the Office of Outreach and Engagement serves Iowa communities. To submit project proposals and request outreach events, scroll down to the request-form links. Engaged-learning projects - We match Iowa communities with faculty and hundreds of students each year to collaborate on community-based projects. When you work with us, your community receives high-quality work while students benefit from real-world experiences related to their studies. Our office provides staff support and serves as a point of contact for your community. IISC Partnership - We manage the Iowa Initiative for Sustainable Communities (IISC), which is a special partnership between the University of Iowa and selected communities. IISC's partnering communities benefit from 10-20 projects involving more than 100 students over the course of an academic year. Communities apply December-January for the following academic year. Speakers - We find UI experts to go to your community or organization when you want speakers to present on a specific topic. Workshops -We will connect your community to UI programs and departments that provide instruction and training on the topics you want, right in your community, for your residents and community leaders. Arts in Communities - We connect your schools and community organizations to UI artists and ensembles for workshops, residencies, and performances. UI artists can enhance your arts programming, tie in to curriculum, enliven the classroom, and expose students and the community at large to a wide variety of arts. Research - We connect communities to UI departments and faculty for research opportunities. Research may be a collaborative process between the researcher and community partner or an independent process that takes place in a community setting. Grant Support - We support mutually-beneficial grant applications as a partnering organization. A University of Iowa community partnership may strengthen your community's grant application and advance shared goals. Please note that the Office of Outreach and Engagement does not provide grant funding directly for communities. UI Directory - We maintain a database of UI programs that provide outreach and engagement services for communities. You can search the database to learn about additional opportunities to partner with the University of Iowa. "You can’t believe what a good feeling it is to see our community change as a result of the commitment from the University of Iowa. We’ve had some hard knocks in Maquoketa and we’re rising above them." Who is eligible? 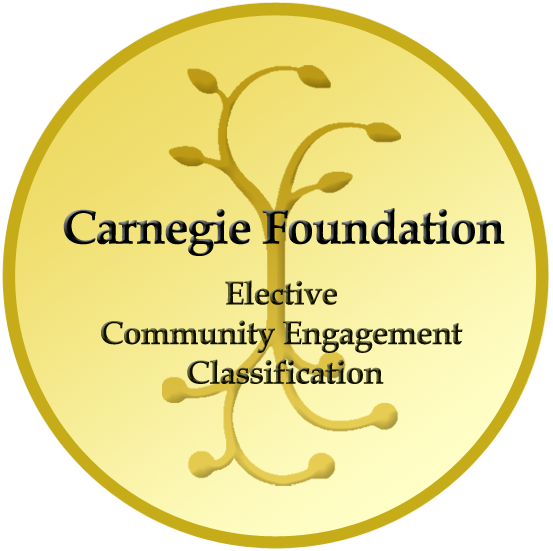 While community often means city, county, or regional entity, our definition of community includes groups affiliated by a special interest, shared values, or shared characteristics such as age, ethnicity, gender, or sexual orientation. Propose an engagement project with UI students, faculty, and staff. Join our distribution list to find out about specific opportunities for collaboration. Submit a request to host a speaker, on a topic of your choice, in your community. Request a UI artist, ensemble, or group in your community for a performance, workshop, or reading. Submit a proposal for collaborative research or grant support. Search all outreach and engagement programs at the University of Iowa. The Iowa Initiative for Sustainable Communities (IISC) is a campus-wide effort to enhance the capacity of rural and urban communities in Iowa to address the environmental, equity, economic, and cultural issues they face today and to help them plan for a sustainable future. The magnitude and depth of an IISC partnership make it unlike any other resource or service we offer. Whereas some partnerships might consist of single project, IISC partnerships bring together faculty, staff, and students from across campus to complete 10-20 projects with the selected IISC community over the course of an academic year. More than 100 students from various disciplines will bring their talents, enthusiasm, and creativity to the partnership. We focus on five different topic areas that are important to Iowa communities. Click below to learn more about these areas and our projects. We have facilitated more than 200 engaged-learning projects throughout the state, using the vast talents and expertise from departments and disciplines across the entire University of Iowa campus.